Whether you’re stepping out to the 17th-century Green Lake Park at your doorstep, or returning from the bustling Central Business District just minutes away, Grand Park Kunming Hotel is your perfect sanctuary in the historic Yunnan capital city of Kunming, China. Centrally located and a 40 minutes’ drive from Kunming International Airport, our hotel’s leisure and business facilities distinguish us as the first international 5-star luxury hotel in Kunming, China. With its undulating wave-like façade soaring 21 storeys above lush green surroundings, the hotel is truly an iconic landmark set to pamper the modern traveller. Our tastefully designed rooms and suites at Grand Park Kunming Hotel, fully equipped with deluxe amenities exude quiet elegance. This Kunming hotel accommodation is a gourmand’s haven with a variety of restaurants featuring sumptuous buffet spreads at Indulge at Park, an all-day dining restaurant as well as authentic Yunnan cuisine at Park Palace. Located in the heart of this beautiful city beside Grand Park Kunming is the picturesque Green Lake (Cuihu) Park, which goes back to the late Yuan Dynasty. Sometimes described as a “Jade in Kunming”, the park is not only known as one of Kunming’s most scenic attractions but is also a perennially popular event venue. Just 10 minutes’ walk from this hotel Kunming in China and you will find one of Yunnan’s grandest and most important Buddhist temple, the Yuantong Temple located at the foot of Yuantong Hill. 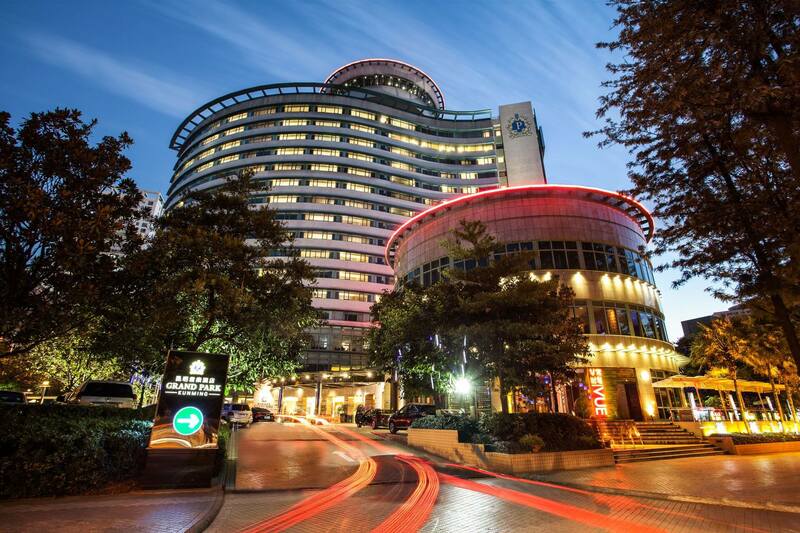 Just a short distance away from the main commercial areas, Grand Park Kunming is a convenient option for business travellers and ideal for leisure travellers to explore the city’s major squares, popular pedestrian streets and markets.